The Pro Kabaddi League 2018 moved on to a new destination for the next leg of the competition as the action began in the heartland of the sport in the nation, Sonepat, in the state of Haryana. The indoor stadium at the Motilal Nehru School of Sport played host to the second stop in the three-month league which will carry on till the first week of January 2019 with the grand finale in Mumbai, Maharashtra. 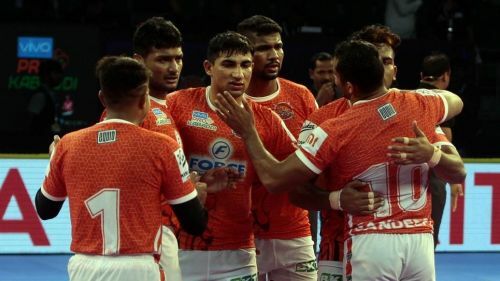 The first match of the day saw the hosts Haryana Steelers start off the home leg with a win over the Gujarat Fortunegiants as Monu Goyat starred in his first match this season leading the side after Surender Nada's injury. The second match of the day saw the Puneri Paltan take on Dabang Delhi KC in an exciting clash on the mat. Puneri Paltan came into the match on the back of a win over the Haryana Steelers in Chennai and were confident with their balanced side. Dabang Delhi KC were fresh off a well-earned draw against the Gujarat Fortunegiants, who were the finalists from Season 5. Puneri Paltan have played two matches so far with one win and one draw. They drew with their state rivals U Mumba in a hard-fought encounter as Nitin Tomar shone with his raiding skills. The defence has been impressive as well with Girish Maruti Ernak and Sandeep Narwal manning the corners for the team. Dabang Delhi KC side had gone a major overhaul in the auction as they added a lot of experience in the squad to bolster their chances this year. The signings of Ravinder Pahal, Joginder Narwal and Meraj Sheykh were critical for them in the auction. They added raiders like Pawan Kumar Kadian and Chandran Ranjith who impressed in their match against Gujarat Fortunegiants. Dabang Delhi KC side held their composure on the mat and weathered the Nitin Tomar storm to beat the Puneri Paltan with a 41-37 scoreline. The Puneri Paltan skipper was brilliant on the left corner and used his strength well to get the tackle points for the team. His ankle holds and strong dashes from the corner were difficult to deal with for the Delhi raiders. The feisty all-rounder who occupies the right corner for Puneri Paltan had a decent outing as he scored a couple of great tackle points and put in the odd raid, whenever needed for the team. He scored a monstrous tackle in the second half when he wrestled Ranjith for a crucial point. The cover defender assisted the Puneri Paltan defence well for the tackle points and despite not getting a tackle point to his credit, was a useful man on the mat. The man who was given the start today had a disappointing first half as he gave away a couple of touch points with hasty tackles from the cover position. The main man for Puneri Paltan started superbly on the mat as he scored the majority of points for the team and Delhi did not seem to have any answers for him. He scored an incredible four-point raid in the first half as he got the all-out on the Delhi side. He finished with a tally of 20 points, which is his all-time best in the Pro Kabaddi League. The lanky raider did well to support Nitin Tomar in the raiding unit as he grabbed raid points in the match. He even managed to get a tackle point in the match after he put in ankle hold. The Maharashtra man had an off-night as he was unsuccessful with his raiding in the first half and was replaced by Akshay Jadhav in the second half of the match. He came back in the second half to grab a couple of points. The all-rounder came off the bench for the Puneri Paltan to replace the misfiring GB More in the lineup. He is another player off the bench for the Puneri Paltan who came on in the second half. He put in a couple of raids but was unsuccessful with the points. The do-or-die specialist came on in the final ten minutes of the match as Nitin Tomar was tackled out by the Delhi defence.